Hi lovelies, I think a few of you have been waiting for the review of this Olay cleansing brush, so here it is! 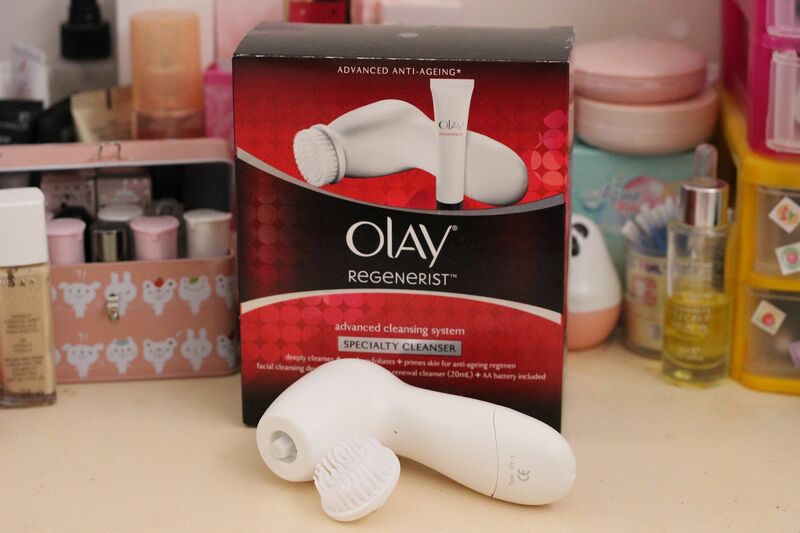 The Olay Regenerist Advanced Cleansing System is a battery operated cleansing brush, not un-similar to the well-loved Clarisonic Mia. It's a much cheaper version of course, retailing here in Australia for about $29.95, while the Clarisonic is about $200! 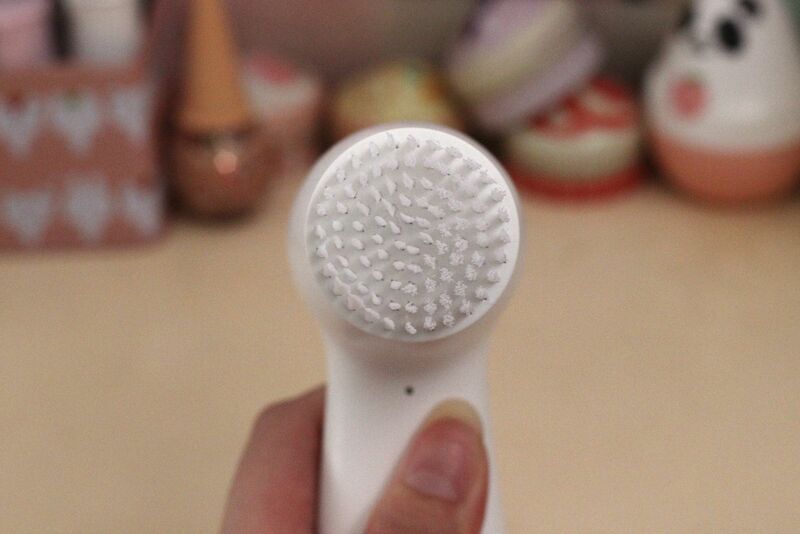 Now, I don't have the Clarisonic, so this review won't be a comparison post, but this may be of interest to you if you're interested in seeing whether electronic face brushes work better than cleansing with bare hands. The 'cleansing system' comes with the cleansing device, one brush head attachment, 2 AA batteries, and a 20 ml Skin Renewal Cleanser sample. I love that Olay included the batteries. I just hate buying things where the batteries need to be bought separately - such a hassel! The cleansing device is plastic, but feels fairly nicely put together. It claims to be water resistant, and I have used it in the shower a few times, but I prefer to keep it from getting wet as much as possible, in the hopes that'll prolong its shelf life. Some reviews I've seen stated that the battery compartment had sticky substances in it, but mine was perfectly clean, without any defaults. The device has 2 speed settings, so you can choose whichever speed/pressure you like. Once clicked on, the brush head spins in a circle at quite a fast pace. Okay, I'll begin by outlining my skin type and the regime I used this brush. Everyone is different with differing needs, which means that how I use it may not be how someone else should use it , for the best results. I have dry-normal skin, and it can be a bit sensitive sometimes, which can lead to flakiness, redness, small red patches, or even milia and breakouts (not fun). When I first started using the Olay brush I did not use it with the provided cleanser, but kept using my regular cleansers instead. I only used it once every evening for the first 3 days (after removing my makeup), and only on the slower setting. It felt a little abrasive at first, but then I learnt to only lightly touch the brush to my skin, and not press it into my skin, which was what was making my skin feel a little tender afterwards. After 3 days I stepped it up to using it morning and evenings (using a super gentle cleanser in the mornings), and it was only on day 5 or 6 that I began noticing results. Not only was my face looking brighter after usage, but I definitely saw a reduction in the size of my pores - and I'm not particularly worried about the size of my pores normally anyway! My skin did seem clearer, and I noticed my bb cream was applying smoother to my face in the mornings, and I was applying a little less bb cream too as a result. Even though I made sure not to press the brush into my skin, a red itchy patch appeared on my cheek anyway, and it kept appearing after every wash. So then I started using it only every 2 nights. Still, little bumps started appearing on my chin - I already had a few previously (don't know whether it's clogged pores or milia, but it's been there for years), two of them turned into blemishes, but fortunately not the huge yucky kind. My skin started to feel more dehydrated, and then some more bumps appeared on my forehead which just freaked me out, because it was previously fairly smooth. Not sure if this was a purging stage but I decided to stop using it. I could have gone on and hoped it was just temporary purging but the reason I stopped is that my skin scars extremely easily, and it doesn't heal very well, so whenever I have a breakout I'm guaranteed a nice red/purply spot that will pretty much stay there. Initially I saw some really great results - however the daily exfoliation regime just didn't agree with my skin. There isn't really anything wrong with the Olay Cleansing System per se, but more that it didn't suit my skin type and skin needs maybe? Overall I thought the brush was well made, affordable, and did give good results with regards to deeper cleansing, pore reduction, and skin smoothing. I'd recommend it, but I definitely think if you have dry or sensitive skin like me, that you shouldn't use it daily. I do hope this review was helpful! Thanks for reading! Are any of you using an electric cleansing system like this Olay one or the Clarisonic? What sort of results have you been getting? I hate it when batteries aren't included grrr!! That's what I'm worried about, that it'll break me out! The Clarisonic does that for some people too. I have really sensitive skin so I probs won't pick this up. there pretty girl ! Wow such a nice blog ! Thanks for the informative review and I'm sorry to hear it didn't work out! I have dry skin too and too much exfoliation causes my skin to get irritated and red too :( I've always wanted to try a Clarisonic or something similar but I guess it's not good for us ladies with dry skin to use daily. I'll just keep to using my hands for now..
Yep, I thought this worked well, but my dry skin just didn't appreciate all that extra exfoliation! I've seen a lot of cheaper look-a-likes coming out - I think even Nivea came out with their own version recently! It might be a bit too much for daily use, but I'm thinking just a few times per week should be fine! It's very helpful since we have almost same skin type. Yes, people usually say it's purging stage, but honestly I won't be patient enough to see results since my skin scars easily as well.. Plus going around for 2 week with a super pimply face is not a great idea.. 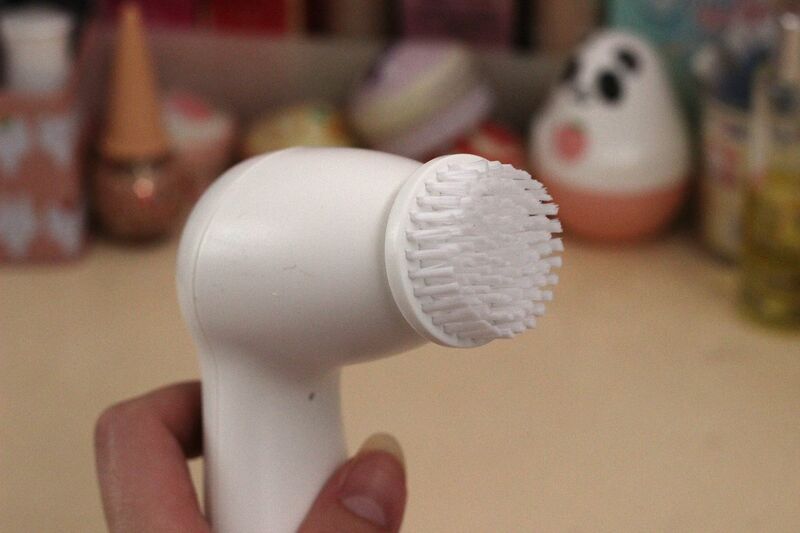 I've considered using an electronic cleansing brushes before, but they're so expensive! I have quite oily skin, so maybe I'll have a bit more luck with this one? But I would probably only use it like two to three times a week, too much exfoliation can't be good for the skin? I'm really liking that cheaper alternatives to the Clarisonic are coming out! I was hoping since it said it was fine for daily use that it'd be okay for my dryer skin, but I guess it was a little too much exfoliation! Ooo, I might look into the Nivea one. Their products are usually quite gentle on the skin.